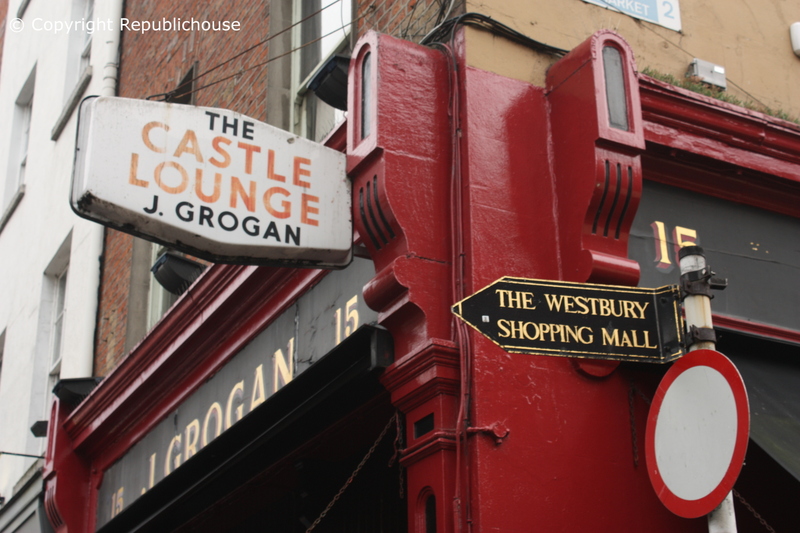 The sign outside notes Grogan’s – or more officially, ‘J.Grogan’ / ‘The Castle Lounge’ to have been established in 1899, but in fact it is much more recent history that has been pivotal in shaping the unique atmosphere for which Grogan’s has become renowned. In 1972, the well-known barman Paddy O’Brien came to work in Grogan’s, having left his role in nearby McDaid’s pub. Paddy had tried to purchase McDaid’s and on being unsuccessful, severed all ties, in due course joining the team at Grogan’s. Paddy was quite a legend within the Dublin pub scene, serving and regaling a host of McDaid’s regulars and genius literary types including Patrick Kavanagh, Brendan Behan, Flann O’Brien, J.P. Dunleavy and Liam O’Flaherty. When Paddy made the switch from McDaid’s to Grogan’s, this eclectic group migrated the short distance across too, to continue the banter with their master of ceremonies. Paddy’s enrolment was thus a key moment in the history of Grogan’s, as the pub thereafter cemented itself as the top haunt for literary and artistic communities in the way that McDaid’s had before it, and how the Palace Bar (of Fleet Street) had previous to that. Paddy was no shrinking violet himself, keeping order with what was a talented but boisterous bunch. Brendan Behan – great poet, playwright and novelist that he was – was also an exhibitionist and craved attention. He was a rowdy, cantankerous drinker; in fact he was arrested for being drunk and disorderly several times. Current owner Tommy Smith who worked with Paddy, also recalls having to deal with a cursing, muttering Patrick Kavanagh, a countryman from the low hills of County Monaghan, who wasn’t one bit interested in adapting his habits to a more sophisticated city style. And yet such difficult characters were some of the finest Irish word-smiths of all time. At first glance, Grogan’s doesn’t look much. In fact, if anything, the interior is somewhat in need of a facelift. However, this misses the point entirely. Spend an hour or two there and you’ll see what I mean. It is quite certainly a very special pub. 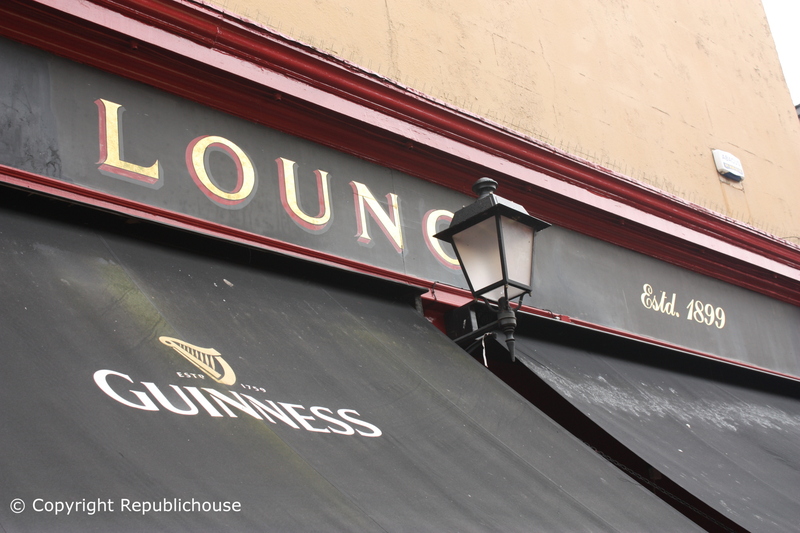 Grogan’s is a ‘local pub’, which sounds nothing, but when you consider that it is situated at the very heart of Dublin’s busy shopping, cultural and entertainment neighbourhood, this is no mean feat. By ‘local’, I mean that it has a dedicated community of patrons that frequent it regularly. 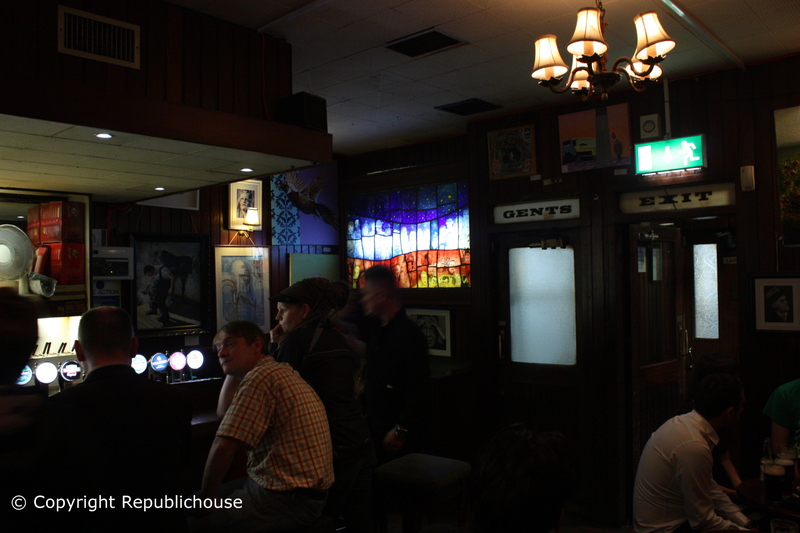 The pub is near Grafton Street, Dublin’s premier shopping district, and a short stroll from speciality shopping centres such as the Westbury Mall, the George’s Street Arcade and the Powerscourt Centre. The latter sits directly across the street from the pub, a boutique shopping complex housed in grand Georgian architecture that was formerly the urban retreat of Richard Wingfield, the viscount of Powerscourt. At Grogan’s, shoppers mix with musicians, avant garde types, blue collar, white collar, artists, university students, young, old, you name it. Grogan’s exemplifies one of the best traits of great pubs in Ireland; a sort of cross-generational, open-minded, democratic appeal. You can rub shoulders with anyone here and chances are, you’ll get talking to many of them too. 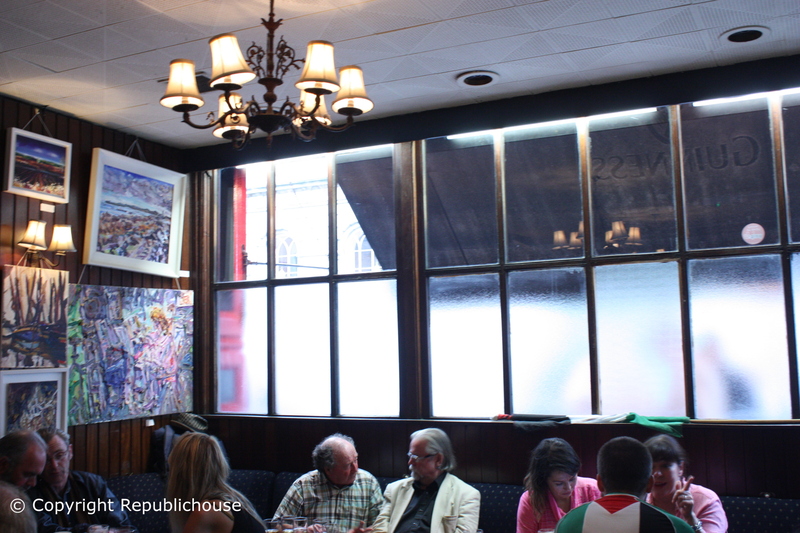 It’s a talkers’ pub; politics, art, current affairs and sport are all up for discussion. There are no T.V.s; no music (neither live nor recorded); there’s simply no need. The vibe is chatty and sociable, full of great tales, humour and debate. The pub has become great, purely by virtue of remaining the same, in a changing world, now surrounded as it is by trendy bars and gourmet food establishments. The colourful conversations of the 1970’s literary crowd, gave the pub an identity to build an entire ethos out of, which is alive and kicking today with a clientele as bohemian as it is down-to-earth. 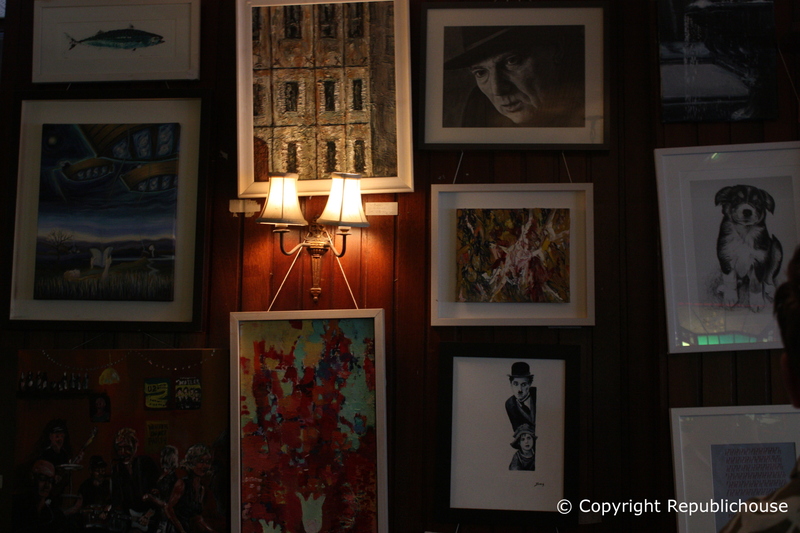 One reason why the pub remains a favourite of contemporary artists is the constantly evolving art collection adorning Grogan’s wooden-panelled walls. The varied selection of artworks is a regular topic of avid conversation, for artists and non-artists alike. The art can be purchased and is a motley collection on any given day, all of which adds to the debate. You may well leave with a masterpiece under your arm, if you’re willing to forfeit good drinking money. Grogan’s reluctance to change, unwilling to concede to sports, music or refurbishment, is also one of the reasons why the pub has generated such a loyal following. Angelika and I are there regularly. On our two most recent visits we sat on high stools by the corner of the main bar counter in the front lounge, which again is a great spot to sit and admire the paintings on view. We also enjoy on occasion sitting outside on the beer terrace, which wraps right around the full length of the pub. 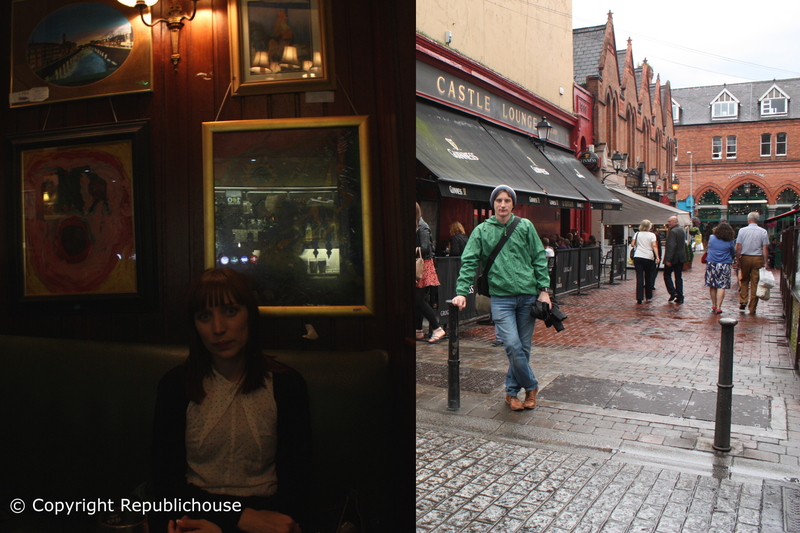 Given the pub’s prime location, it’s one of the best spots in the whole of Dublin to sit and ‘people watch’. Overhead heaters and canopies make that an option even on cooler days. Personally in fact, I prefer to sit outside on a colder day, wrapped up warm under one of the heaters, while clutching a crisp pint. Speaking of which, on our most recent visit, a pint of lager and a Guinness was just €10 or so. The interior consists of a large but cosy 1970’s style lounge, with bench seats along the walls and plain tables and stools to be dragged hither and thither. A navy, floral carpet runs from the front bar into terracotta tiles in the L-shaped smaller back bar. The glow of brass, lamp-shaded wall bracket lights accentuates the latest collection of pictures. White ceiling tiles and old air-conditioning units emphasize the function over fashion attitude here, as do the casually dressed staff, and the general grungy vibe. Basically, Grogan’s has its modus operandi, take or leave it, including the need to have a fully stacked fridge of ham & cheese sandwiches, ready to be toasted and delivered to needy souls. “That was enough to endear Grogan’s to me for life (…)“, as Bill Barich so amusingly, yet touchingly, reflects – about Grogan’s ham & cheese tradition – in his fine book ‘A Pint of Plain’. They have proper jars of Colman’s Mustard for your sandwich too. This pub keeps things simple but hits all the right notes in ways that matter to its loyal following. Grogan’s has heart and its heart beats strong. 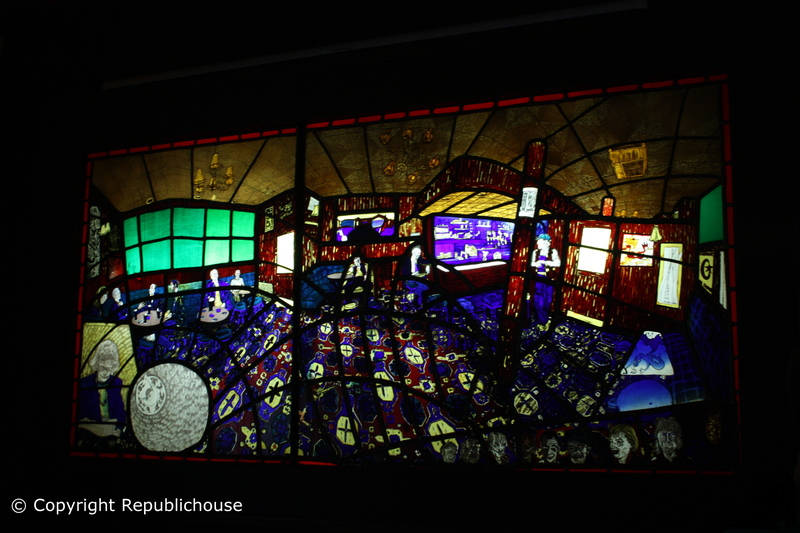 Grogan’s has a lovely stained glass wall-light celebrating…well…itself! There is a mixed clientele but an even more mixed collection of artwork on the walls! Visit because: Grogan’s is a Dublin institution; essentially a local ‘country’ pub, right in the heart of Dublin city centre. Its constantly evolving art collection is always a subject of great debate and in general, it’s a very sociable pub where artistic and non-artistic types meet and chat freely. Many pubs do ham & cheese ‘toasties’ but nobody does them quite like Grogan’s. Thank you John. We should team up for a pub trip soon! Best (traditional?) pub for craft beers…? Any thoughts? Ciaran, cheers for the ‘like’ all the way from Taiwan. Good to hear from you sir…. A little bit of history on 15 South William Street ….1840s to 1885 Anne Ledwidge owned a butcher shop here , she was a supplier of meats to the lord lieutenant of Dublin …. From 1885 to 1895 it was known as James Moran , grocer and spirit merchant …. From 1895 to 1948 is was known as James Bowe , spirit merchant …. 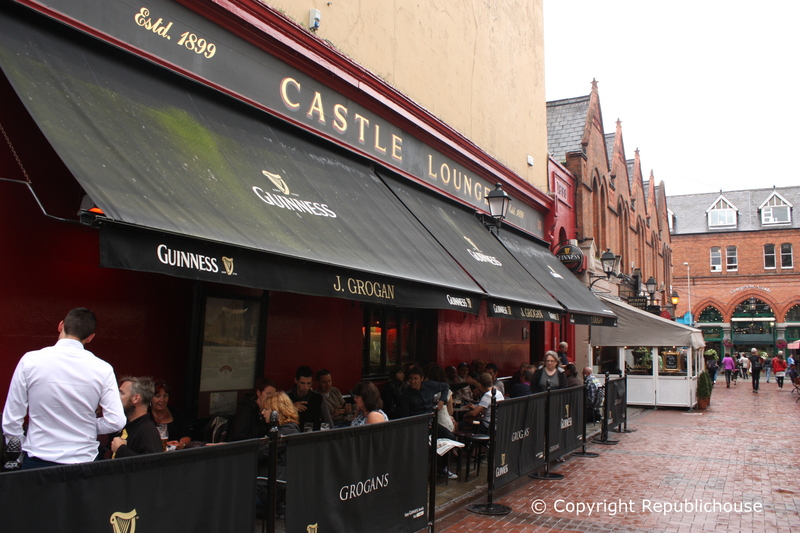 from 1948 to 1959 it was known as Michael Finnegan , the castle bar wine spirit merchant ….. from 1959 to the present day J Grogans the castle lounge …. Great article. I’ve just become very interested in this pub’s history. Does anybody know how it became J. Grogan above the door? Who was J. Grogan? I’m still researching but it looks like my great great uncle was James Bowe who ran this great bar early 1900’s. He’s also linked to Bowe’s on Fleet Street. Any more history on this most appreciated. Hi Tadhg, many thanks for getting in touch. Yes it was known as Bowe’s between 1895 and 1948, and yes run by James Bowe … how lovely for you to be related to the very man. It has been known as Grogan’s since 1959, although likewise, I’m not sure who the person behind the name is…I must do some digging on this…although perhaps if anyone else out there is reading…they may chip in with some facts…I love a challenge..I’m sure we’ll get to the bottom of! :) May even zip across to Grogan’s for a pint today! The sun is out! Hi Martin. Love the extra heritage trail you’ve provided! Many thanks. Thanks Damien , it was simple enough to do , it’s from the Thom’s Street Directory of the times . 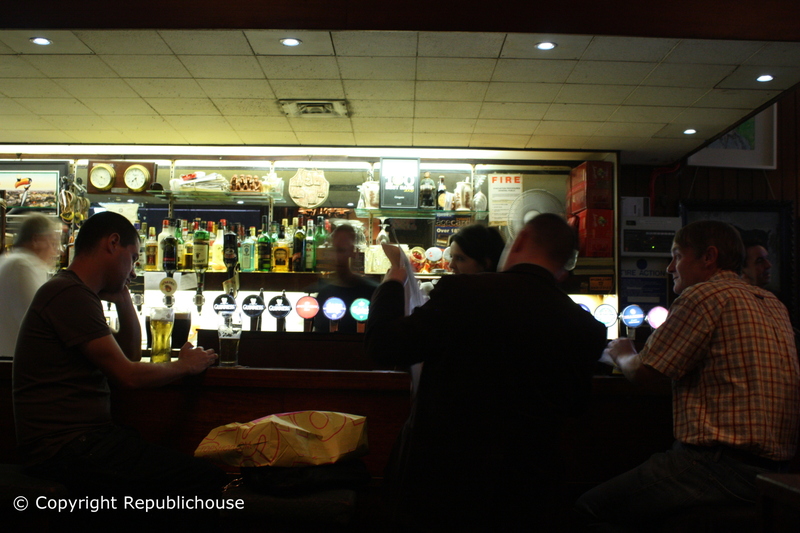 Search for “publichouse” (all one word) and enjoy. Hi Pier, thanks for getting in touch. Wow, read that witness statement…very evocative…another strand in the imagination as to what’s so special about Grogan’s (or Bowe’s as Martin above says…and as it was at the time of this incident…!) Fascinating. What brave women.